The drivers; Who’s where so far? THE 2018 Liqui-Moly Bathurst 12 Hour entry list released last week sets the scene for a thrilling race between some of the best brands in the world – but who’s going to be behind the wheel? A busy week of announcements last week put in place several key pieces in the driver puzzle; though there’s still holes to fill. Despite the gaps, there’s already some of the best and brightest from the Virgin Australia Supercars Championship, while the big brands have drawn on significant factory firepower to bolster their squads already – with many more to come, we suspect. With that in mind, here’s a rundown of who are already confirmed starters for the February 2-4 event, and who is yet to lock in their plans. Already it makes for tasty reading – and you can be bet it will get stronger yet when some of the yet-to-be announced combinations are made public. NUMERICALLY, Audi are the most well-represented brand in the GT3 class yet only one of the 10 R8s entered has had a combination announced. That trio – Marc Cini, Lee Holdsworth and Dean Fiore – will drive Cini’s Hallmarc entry which will be one of a fleet of cars from Audi Sport Customer Racing Australia. The Troy Russell-led squad is yet to confirm any other pairings, though you can expect several of them to pack a significant punch. Both Jamec-Pem Racing entries, for example, featured fully professional driving squads this year. The other two Audi’s are the pair entered by Belgium-based outfit WRT. If there were a betting market on drivers, the odds on both of their cars featuring driver combinations with race-winning potential would be ridiculously short. WRT tend to not enter races they don’t believe they can win. 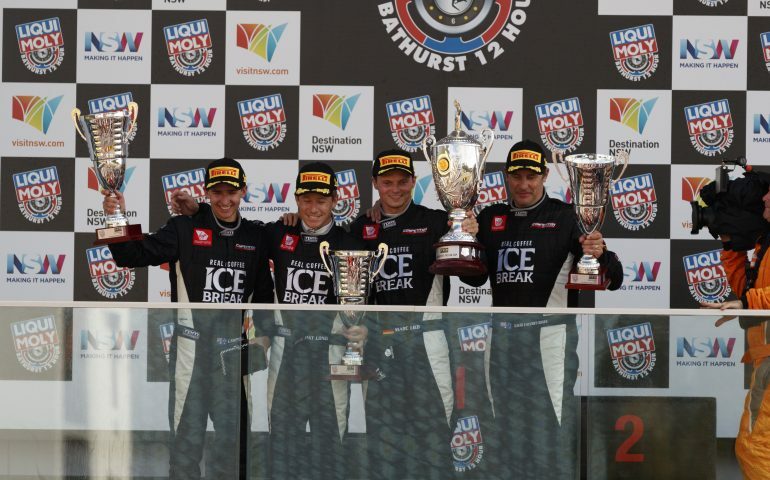 BACK for another crack at an elusive Bathurst win, Bentley confirmed much of their existing squad would return in 2018 save for Ollie Jarvis being replaced by young Frenchman, Jules Gounon. That means Guy Smith, Steven Kane, Any Soucek, Maxime Soulet and Vincent Abril will all be back. Though they are yet to announce formal combinations, you would be hard pressed to split up the Smith / Kane combination that has finished fourth, third and third in the last three 12-hour encounters on the Mountain. FIREPOWER is the name of the game here, with both the BMW Team SRM entry and the Schnitzer car featuring a mix of local and international, factory talent to give the German brand their best shot at a first Bathurst enduro victory since 1997. Steven Richards will have Timo Glock and Phillip Eng in his car, while Schnizter has plumbed for Chaz Mostert – already a Bathurst winner over six hours and 1000km – and DTM stars Marco Wittman and Augusto Farfus. Glock and Wittmann were both part of BMWs attack this year so will be as fast as anybody, while Eng and Farfus won’t take long to get up to speed. NEW ZEALAND’s Trass Family Motorsport has had a spread of talented drivers in their 458 GT3 in recent New Zealand races but there is yet to be word on who will be coming to Bathurst. SOLID combinations have already been announced for the raging bull, notably the consistent pairing of Steve Owen and David Russell in Roger Lago’s JBS Racing Gallardo R-EX. The Black Beauty may be getting a bit old now but, remember, it wasn’t long ago that this car was qualifying at the pointy-end, let alone strong finishes in the last few years. Trofeo Motorsport have locked in the same combination as this year too, with Jim Manolios joined by Dean Canto, Ryan Miller and Ivan Capelli. Richard Gartner is yet to fully confirm who will join him in the bright yellow Safe-T-Stop car, but we keep hearing the name ‘David Wall’ thrown about, which would make it a very feisty combination indeed. OBJECTIVE Racing were quick to confirm that Tony Walls would be joined by Jaxon Evans, Warren Luff and Tim Slade in 2018, instantly asserting themselves as Pro/Am class contenders early in the piece and, should all go to plan on race day, a possible outright threat too. Much speculation has hovered around the pair of YNA Autosport McLarens that appeared on the entry list last Friday – and will continue until they make a formal announcement. That speculation suspects McLaren, however, will return to being a force on the Mountain next year – so we watch this space with interest. SIX AMG GT3s make for plenty of grunt from the German brand – as does the Max Twigg / Tony D’Alberto / Craig Baird combination Scott Taylor Motorsport has announced for their lead car. It’s a good combination, too. Strakka Racing announced Cameron Waters would lead their first entry announced, a handy signing for his Bathurst miles even if he hasn’t done a heap of GT3 racing. He will be joined by Nick Leventis, Lewis Williamson and David Fumanelli in the lead Strakka car. That trio are experienced GT drivers but it remains a hard combination to predict results for at this early point. Drivers for the second Strakka, second STM and Ninteen Corp – that’s Mark Griffith’s car – entries are yet to be confirmed. One additional AMG GT3 was announced on Friday however a team affiliation or entrant was not named, adding an air of mystery to the AMG arsenal.. IT is amazing to consider that Porsche have never won any of the Bathurst ‘majors’ – however 2018 could be their year. Manthey Racing will come with Dirk Werner, Romain Dumas and Fred Makowiecki aboard their entry and you suspect that is a combination they would have quite happily thrown in one of their 919 Hybrids at LeMans this year should they have had enough cars. Black Swan Racing will make their debut and could be contenders based on the driver roster the announced several months ago. Tim Pappas has endurance experience aplenty, as does Jeroen Bleekemolen – who adds Bathurst miles to that mix. Black Swan announced David Calvert-Jones would be involved in their team though given his own outfit – Competition Motorsports – will be back in 2018 we don’t know if he’ll drive for his own team or not. Watch this space for both that, and who else is in the Competition Car which was a podium finisher this year. OF the five Porsche’s in Class B, we know two combinations so far. Two-time race winners Grove Racing will have the father-son combination of Stephen and Brenton Grove to be joined by Ben Barker – a familiar face to the team and indeed the race. Meanwhile, Team Porsche Carrera Cup Asia will have Paul Tresidder, Chris van der Drift, Even Chen and Andrew Tang in their squad with each representing the Asian one-make category. Danny Stuttered and Sam Fillmore have been confirmed in their Ash Seward-prepared car, though a third driver has not yet been named. THIRTEEN GT4 cars are on the grid for 2018 and it’s set to be an incredible battle – though only the works KTMs have announced drivers. Their first car will be piloted by Justin McMillan, Tim Macrow, David Crampton and Caitlin Wood; a unique blend of experience in the car, the race, the sport in general and with KTMs specifically. The sister car has Glen Wood, Trent Harrison and Cody Hill and it should make for fascinating inter-team combination. DAYTONA Sports Cars locked in their drivers late last week, just before the entry list was released. Ben Schoots, Adam Macrow and Michael Caine will steer the Dodge Viper, while Jamie Augustine, Dylan Thomas and Rhys Howell will be behind the wheel of the enormously popular Daytona Coupe. MARC Cars Australia will bring close to 30 drivers for their remarkable eight-strong campaign, surely one of the biggest ever mounted on a Bathurst enduro by a single team / brand. Expect their roster – or most of it – this week.